TAVERNIER — The easygoing, self-confident solo guitarist spoke of the balance necessary to play bars and clubs on weekends and struggle to work for rent money at a day job Monday through Friday. "Being successful in this business is like selling insurance. It's selling yourself," says Scott Youngberg, 37, who knows all about being a part-time musician. "Then the lights go on and the magic begins," he adds. It is easy to understand the magic of which he speaks when he straps on his "Keys guitar," the one with the jumping dolphins, and begins to play. 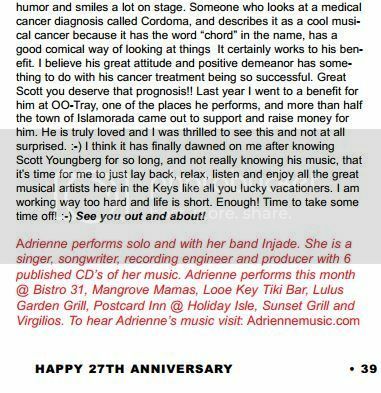 Youngberg's first gig in the Keys was a popular Islamorada restaurant with an outdoor cabana and beach bar. "I got my start at the Lorelei. That's my alma mater," he says, relaxing on a Friday afternoon in the home he shares with his wife, Suzi Youngberg. "I also waited tables there." That was in 1997 when he played mostly bars and clubs. Then he began playing on the beach at Morada Bay as well. He gives his wife ample credit for his musical success. "Suzi gave me the gift of time," he says. "She worked full-time and I was able to lean on her at the beginning. She gave me time to get my act together, literally." Now, after building a local reputation for seven years, his calendar is booked, mostly for private parties such as weddings and birthdays. He has found himself singing his magic more often since he hooked up with Island Weddings, the folks who operate the Caribbean Café in Islamorada. Youngberg says he plays "happy hour music," songs from the '70s and '80s. "I play mostly original and soft rock tunes," he says. "No hip-hop, rap or boy band songs. Suzi and I co-write the music. I do the arrangements, and she is the wordsmith." Happy hour music notwithstanding, Youngberg's voice has a smooth quality capable of melding with the voice of the original recording artist. He possesses the ability to sing Neil Young's "Heart of Gold" and force the listener to think of Young, and then, on the next song, sound like his favorite musician, Harry Chapin, when he sings the classic "Taxi." Those musicians he considers mentors, that have provided the most inspiration, are the Beatles, Paul Simon, Harry Chapin, Pink Floyd and the more obscure Mike Oldfield. About the Beatles, Youngberg smiles and says, "They did it all." Born in Waukegan, Ill., the son of a successful businessman, Youngberg spent his early years in Upper St. Clair, Pa., a Pittsburgh suburb. His family moved back to Illinois and he graduated from Wheaton Central High School in 1985. He lasted about a year-and-a-half at the University of Tennessee at Knoxville as a business student. Somewhere along the way he realized that only music would make him happy. "At first my dad wasn't happy with my decision, but now he's a big fan," Youngberg says with a grin. "I wanted to play guitar. I had been playing since seventh grade." He and Suzi married and they moved to the Keys after having vacationed here for scuba diving. Like so many, they loved it and stayed. When they're not working they may well be out on the water in their boat, "Idle Hours." Youngberg plays a crisp, singing acoustic guitar. He also has learned to play a little keyboard and has rigged a harmonica so he can play without using his hands. It is particularly effective in the opening song on his "Live at Sunset" CD, "Heart of Gold." When asked where he wants to go with his career, he pauses before speaking. "I'm suffering from a lack of a goals," he confides. "If this is as good as it gets, so be it. It has something to do with my Caribbean soul. "I don't want to tour the country. I just want to live here and be happy. Suzi and I knew, when we first met, that we'd live near a beach someday. We didn't know it would be on an island." 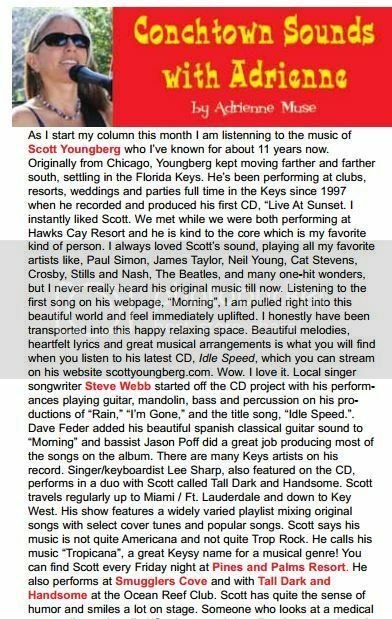 Youngberg performs from Christmas through early summer at Cheeca Lodge on Wednesday and Friday from 6-10 p.m.; at the Water's Edge Restaurant at Hawks Cay on Duck Key, Saturdays from 8 p.m. to midnight. ; and at Morada Bay on Mondays from 6-10 p.m.
Subject : Re: Thanks from Key Largo!! Thank you, Scott, for all of your participation during the event! We all enjoyed your music so much. We will be back in town next week, Thursday, 3/22 through Sunday, 3/25 as Wyland adds the final touches to the wall that were delayed due to the rain. We will have our gallery and foundation tents up as we did before. If you are available and would like to come out and play, we would love to have you. Your music really adds a lot to the event. Thank you again for everything and I look forward to seeing you again soon.